Multiquip is proud to offer the world's premier line of concrete trowels. Whiteman trowels were the first on the market and continue to lead the industry in quality, reliability and innovation. 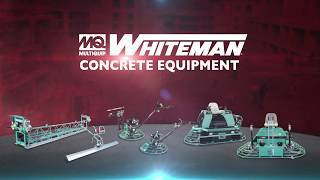 MQ Whiteman Ride-On Trowels are the most powerful and dependable machines in the industry. MQ Whiteman Hydrostatic Trowels are the industry leaders in producing maximum floor flatness. These reliable models are durable, easy to operate and smooth running. MQ Whiteman Mechanical Trowels feature many built-in benefits and unique features that surpass contractor expectations. Features like gasoline / LPG engines, TwinPitch control, durable gearboxes and constant-velocity joints allow the operator to overcome constantly changing conditions on the jobsite.